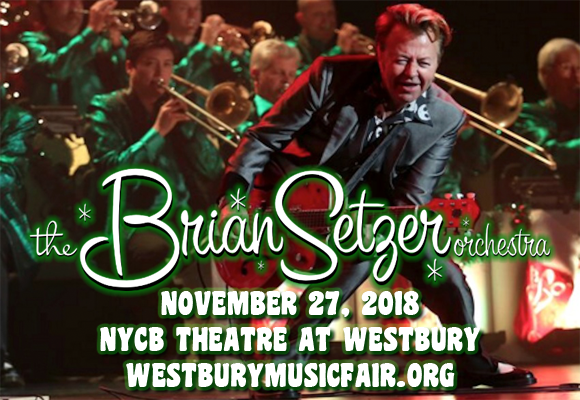 Long Island native and former Stray Cat Brian Setzer brings his seventeen-piece swing band, the Brian Setzer Orchestra, to NYCB Theatre at Westbury on Tuesday 27th November 2018 for a night of festive fun! Bringing a zesty twist to all your favorite holiday classics, the Brian Setzer Orchestra will have you boogieing away those winter blues and getting in the Christmas cheer in their own inimitable, retro way! Get ready to jingle those bells, baby! American guitarist, singer, and songwriter Brian Setzer began his career in music in the late 1970s as a member of two bands: The Bloodless Pharoahs and the Tomcats. With a change of personnel, the Tomcats became the Stray Cats, and in 1980 the band moved from Long Island, New York to London, England. With a distinctive rockabilly sound, the group released their debut album, Stray Cats, in 1981 and launched the hit singles "Stray Cat Strut" and "Rock This Town". The group released three successful studio albums before disbanding in 1984 (although they would reunite, tour and record sporadically over the years). After life with the Stray Cats, Setzer started the Brian Setzer Orchestra; a seventeen-piece jump blues swing revival big band. The group released its self-titled debut album in 1994, and found success four years later with its cover of "Jump, Jive an' Wail" by Louis Prima, taken from the album The Dirty Boogie (1998). The single became a hit on the Billboard 200 and won the Grammy Award for Best Pop Performance by a Duo or Group with Vocals, while "Sleep Walk" from the same album won the Grammy for Best Pop Instrumental Performance.